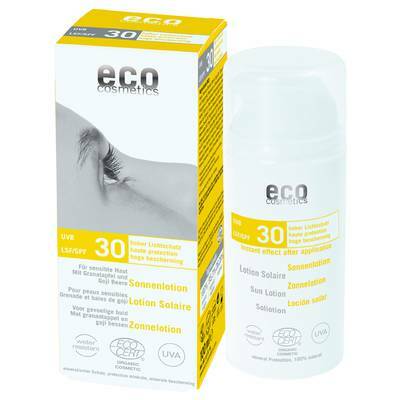 For you eco cosmetics has developed a complete range of sun care products that protect your skin from the sun and its dehydrating effects. The pure natural mineral light protection filter of titanium dioxide combined with magnesium and mica reflects the harmful rays of the sun. With its fresh fragrance and gentle formula this sun lotion is suitable for all skin types. The improved production method enables a consistency and application that will surprise you. The sun lotion can be applied very easily without leaving any visible residue. Valuable ingredients such as pomegranate seed oil* and pomegranate extract* care for the skin and protect against moisture loss. has been considered an important medicinal plant and healthy fruit in China and Tibet for over 3,000 years now.